FACT: Embroidery is awesome. It's a beautiful, simple and rewarding pursuit. Did I mention I love it? A friend of mine recently decided to try embroidery for the first time and, like me, has fallen for it hard. I hadn't completed a project in a long time, but her excitement reminded me of all the reasons I fell in love with embroidery in the first place. And it's easy to love embroidery! It really, really is. It is incredibly easy to learn. Yes, there are some more complicated stitches that I can't seem to master (I'm looking at you, Chain Stitch), but most of them are very simple. Like most people, I began with split stitch and was off like a rocket. Stem, lazy daisy, back stitch and even occasionally-dreaded french knots were an easy progression from there. If I can learn it, anyone can. 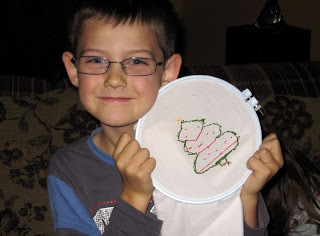 In fact, over the Holidays, I taught G's nephew Josh to embroider. He'd been admiring what I was working on, and asked me to show him how to do it. Look how well he did - all by himself! I did the star on top, and drew the tree outline for him to follow, but the rest is all him. He was so proud, as he should be. Embroidery is so cheap compared to many other crafts. Yes, I splurged on Sublime Stitching's beautiful Stitch it Kit when I first decided to learn embroidery, and I certainly don't regret the investment. Occasionally I buy craft treats - like some beautiful variegated floss - but for the most part cost is incredibly reasonable, especially when you consider the results! For $5.00 I come away with a rainbow of floss, or a couple of hoops. Can knitting do that? Scrapbooking? Sewing? Certainly not! I also love the quick gratification that can come from embroidery. Pick a simple design and a back stitch and you have a lovely complete project in no time. It's so satisfying! When searching for a creative hobby, I quickly realized I needed something that I was going to be able to pick up for awhile and put down again, and something I could easily do in front of the television or while talking to friends. Again, embroidery completely fit my personality. I did the first half of this unicorn while hanging out with family at Christmastime, and the second half while watching Pride and Prejudice (the BBC miniseries, of course) with my friend Maggie. Lots of distraction, and yet I got it done in good time and think it still turned out beautifully (in my opinion). Now, if you'll excuse me, my floss and hoop are calling. Love your blog post, Heather--now you need to post another one! It's true, Sylvia! I've been quite slack lately. I'll get on it!